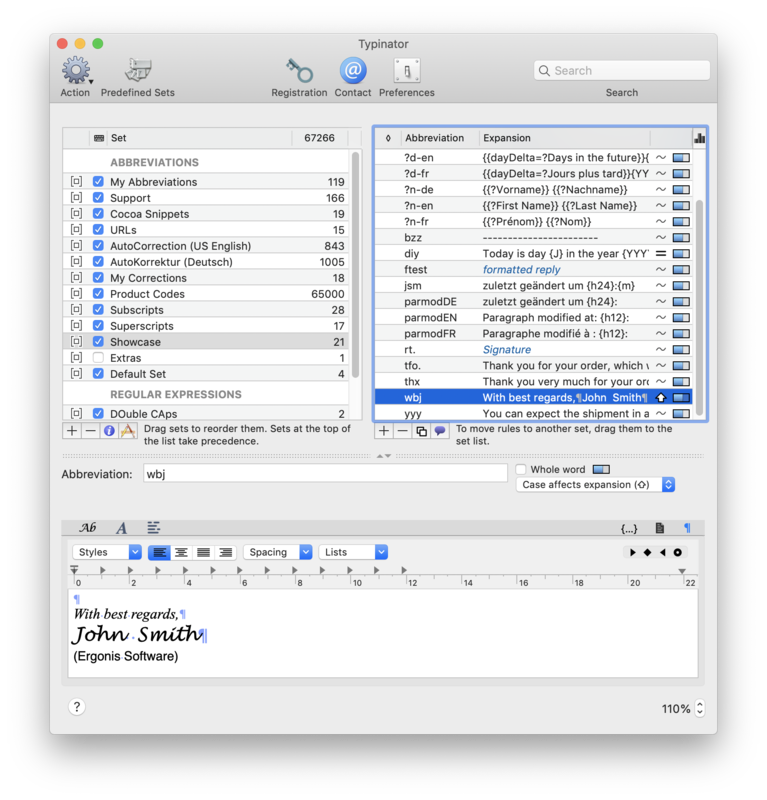 [prMac.com] Perg, Austria - January 16, 2018: Ergonis Software today announced Typinator 7.4, an improved version of their highly acclaimed text expander for macOS. Typinator's primary use case is to type an abbreviation and get the expansion inserted into your document. But finding good, short, and still unique abbreviations can be a challenge, in particular when you have hundreds of similar items. Instead of inventing and remembering hundreds of abbreviations, Typinator's Quick Search feature helps to find all items that match certain keywords or phrases. But until now, the list of matching items was limited to the height of the screen and therefore contained only the most relevant items. Typinator 7.4 removes this limitation and displays all matches in a scrollable list. The new version now also works with text entered via Keyboard Viewer. With a long list of more than 30 further usability and compatibility improvements, version 7.4 is a must-have upgrade for every Typinator user. Visit Ergonis Software's website to learn more about the changes in this release and to download and try the new version. Typinator 7.4 can be purchased securely on the Ergonis Software website. The upgrade to Typinator 7.4 is free for Typinator 7 license owners and for anyone who purchased a license for Typinator 6 in or after January 2016. Upgrade paths are available for owners of older licenses. For information about purchases, including enterprise licenses, volume discounts, and upgrade pricing offers, see the company's web site. Headquartered in Perg, Austria, Ergonis Software Gmbh is a privately held software development company founded in 2002. With a focus on innovation, Ergonis develops ergonomic and intuitive software that boosts the productivity of Mac and PC users alike. Copyright 2002-2018 Ergonis Software Gmbh. All Rights Reserved. Ergonis products are either registered trademarks or trademarks of Ergonis Software GmbH. Other company and product names may be trademarks of their respective owners.